Please note that these microscopes are made by Meiji Techno, the finest microscope manufacturer in the world. These scopes were originally sold by the GIA and Gem Instruments. The scopes I offer are of the finest quality you will find in the world at any price. And I urge you to compare my prices before making any purchase. You can learn more about Meiji Techno by clicking on their name banner above. Please see their warranty information at the bottom of this page. 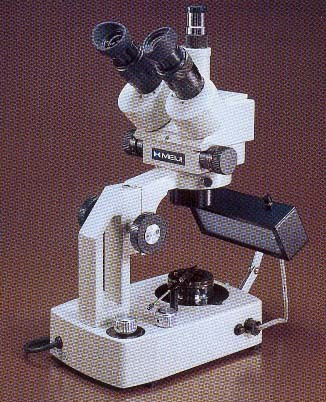 You all know the history of my personal microscope made by Meiji that was also sold by the GIA in 1988. And you know my commitment to quality. The scopes offered below are top quality models at prices below other comparable models on the market. And most important, I can say that I have used one heavily for the past 16 years and it still takes all of the microphotographs here on YourGemologist.com. If you want that kind of quality at very affordable prices...here they are. I urge you to compare my prices to every other dealer. 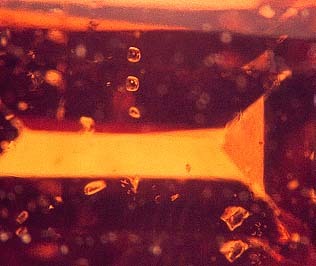 Same rutile inclusions shown at right but under 30x with YourGemologist's 16 year old Meiji Techno microscope. This is the basic model that I have used for years. This one will be different from the GemT-2 below as you will notice by the stationary base as opposed to the tilt swivel base of the GemT-2. For those not having to work with a lot of customers and don't need to swing the scope around for viewing, An excellent, cost effective gemological microscope that will last you many, many years...just as mine has. Stereo microscope with turret changer of 10x to 30x. Magnification goes from 10x, 20x, 30x , and 60x with the super widefield eyepieces that come with the unit. The additional eye pieces are included at this price. Stand with fluorescent light source. Also available in the GM-4T with 10x,20x,40x, and 80x magnification for the same price. This is the basic model that I have used for years. This one will be different from the GM-2T above only in the area of magnification. The GM-4T comes with occulars that provide 10x, 20x, 40x, and 80x. Stereo microscope with turret changer of 10x to 40x. Magnification goes from 10x,20x,40x, and 80x with the super widefield eyepieces that come with the unit. The additional eye pieces are included at this price. With magnification for the same price. 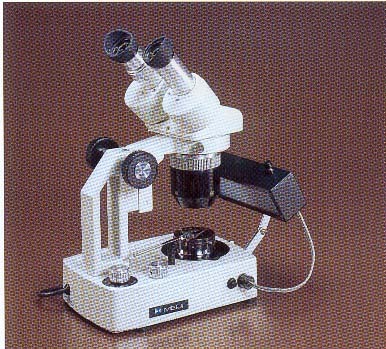 This is the new edition of the microscope that I have used for the past 16 years, and to shoot all of the microphotographs for YourGemologist.com. It is now available on YourGemologist.com at a price that will make this the best microscope buy you will find. Compare my prices for yourself. Also included (very important) are 20x eye pieces that allow you to go from 20x to 60x power. As high as any of the more expensive microscopes. Wide Field Viewing! 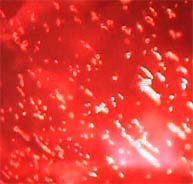 This is what makes these microscopes stand out from anything on the market...wide field viewing. This is the size of the field of vision that you have to work with, which is one of the most important aspects you should consider when buying a microscope. This is where most of the cheaper microscopes are very, very poor, and what the more expensive scopes fail to offer. 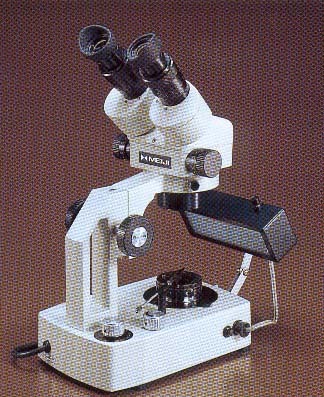 This is another new edition of the microscope that I have used for the past 16 years, and to shoot all of the microphotographs for YourGemologist.com. 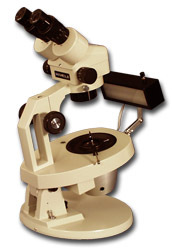 It was originally sold by GIA Gem Instruments but is now available on YourGemologist.com at a price that will make this the best microscope buy you will find. 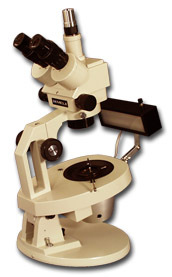 This model offers a greater magnification than the GemT-2 shown above. Up to 80x and that is included at this price. A binocular stereo vision turret with 1x and 4x objectives that, when used with the 10x eye pieces, gives you 10x and 40x power magnification. Also included (very important) are 20x eye pieces that allow you to go from 20x to 80x power. Higher than any of the more expensive microscopes. 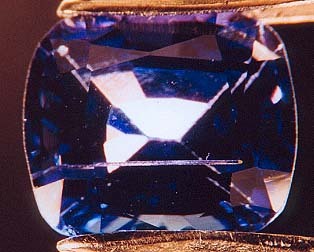 Same inclusion area under 30x making identification of this as synthetic alexandrite very easy. Once again, comparable to the GemZ-5 below but with the stationary base. 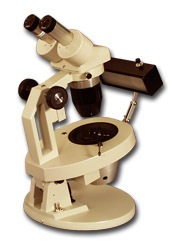 This is an excellent zoom stereo microscope for the serious gemologist and appraiser. Offers more features that scopes costing thousands of dollars more. ZOOM stereo microscope with magnification going from .7x to 90x...higher than any standard equipment from any other manufacturer. Comes with the 10x and 20x eyepieces to reach this magnification as standard equipment. I can tell you that this unit is built like a tank. It is the same basic model I have used for years. This microscope will last you a lifetime if you take proper care of it. This model features the same zoom magnification and focus as the expensive microscopes, but at a far more affordable price. Binocular stereo zoom vision with .7x to 45x zoom range with a magnification from 7x to an incredible 90x, using the 10x and 20x Super Wide Field eyepieces. Includes both 10x and 20x eyepieces that allow up to 90x magnification. 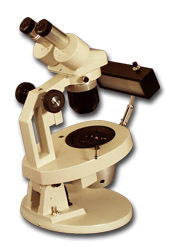 More than any other microscope offers as standard equipment. Wide Field Viewing. This is so important! Once again, all of the features you see in the GemZ-5TR below but with the stationary base. For those doing gemological work in a lab or appraiser's office, this is a good choice to keep all of the features but save some money. Trinocular stereo zoom vision with .7x to 45x zoom range with a magnification from 7x to an incredible 90x, using the 10x and 20x Super Wide Field eyepieces. Directs image to right eye tube and image port at the same time. Now compare this model to anything else on the market at twice the price. It offers the same wide range of magnifications as the Zoom 5 model, but this model offers a camera/video port that allows you to photograph or video at the same time...and the same image, that you are viewing through the right eye piece. 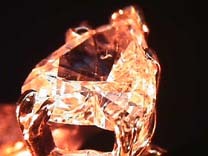 Once again, all of the features you see in the GemZ-8TR below but with the stationary base. For those doing gemological work in a lab or appraiser's office, this is a good choice to keep all of the features but save some money. Important difference is that the image is sent to both eyepieces and the video port at the same time. Directs image to both eye tubes and image port at the same time. Now compare this model to anything else on the market at twice the price. It offers the same wide range of magnifications as the Zoom 5 model, but this model offers a camera/video port that allows you to photograph or video at the same time...and the same image, that you are viewing through both eye pieces at the same time. I guarantee the best price on any Meiji Techno microscope. Plus, I will include the video: Gem Equipment 101 with every purchase to show you how to use your new microscope. Warranty: Warranty of Meiji Techno's products extend to the original purchaser of the Meiji product and is not transferable. Duration of Warranty: Meiji Techno warrants this product against defects in material and/or workmanship for the life of the instrument from the date of original purchase to the original purchaser. The electrical warranty is 90 days. Warranty Coverage: Meiji Techno will repair or replace, at its option, any instrument which under normal conditions of use and service proves to be defective in material or workmanship. No charge will be made for labor or parts with respect to defects covered by this warranty, provided that the word is done by Meiji Techno. This warranty does not cover expenses incurred in the removal of reinstallation of any instrument or instruments, whether or not proven defective. Replacement or repairs furnished under this warranty are subject to the same terms and conditions of the original warranty. A full line of attachments for photography and accessories is available, as well as replacement parts and lighting. Contact me and let me know what you need. I will find a genuine Meiji Techno item to fit your needs. I use these scopes on a daily basis for gemological testing and photography. So I can help you with all of your questions and requirements. 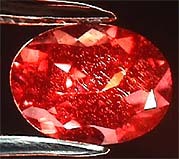 YourGemologist!